Betworld, owned by Online Payment Solutions Ltd, was established in Malta in August 2013. It operates under an official license obtained in Curaçao and, in just two years, has managed to establish itself on the market and won the approval of a large number of fans. 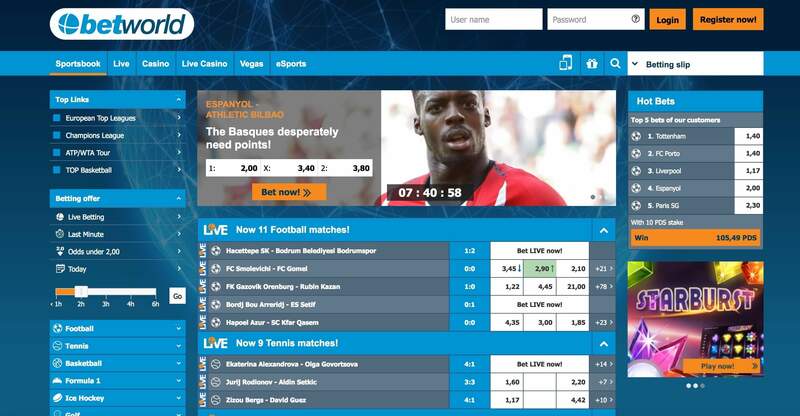 This bookmaker is not yet that well-known in Europe, yet many people are accessing the platform attracted by the wide range of games provided, as well as high security and ease of use. Sports, live poker, casino, blackjack, virtual games, financial betting, roulette, over 450 slot machines and much more. When you register on Betworld, confirm your identity as shown and make your first payment. You can start seriously testing all the various games, which we will explain shortly. Obviously, you can always contact customer support, which is always available through live chat for any technical information or to ask questions. Betworld is greatly appreciated thanks to its simplicity and for its ability to demonstrate being able to offer its users only the best in sports betting. The presentation is highly intuitive. You can choose from many sports such as boxing, cricket and darts. Then there are the “great classics” of sport, including tennis, Formula 1, football, horse racing and rugby. Once you have signed up and charged your gaming account, you can easily start betting on sports events and even seek advice, for example on the rankings of the top and most-played bets. You can make multiple or single bets based on your needs. Many people prefer the thrill of the casino rather than simple sports betting. Betworld offers users a choice between virtual and online casinos. In the virtual casino, for example, you can play over 453 slot machines, of which 11 have progressive jackpots. You can choose from over 117 variations of table games including blackjack, poker, roulette, dice and baccarat. And what about virtual sports? Football and horse races are at the forefront. The live casino section, on the other hand, offers an experience very similar to that of real casinos. Here, you can liaise with real croupiers, chat with them and of course win a lot of money! This section is very much appreciated, especially because it offers a variety of games using different software. The subsections are Portomaso, Evolution and Vivo. You can find baccarat, roulette, blackjack, Texas hold’em, multiwindow and punto banco. The V Games area is where you can find the virtual sports of Betworld. Basically, you can bet as you would in any sports competition, only instead of wagering on a real game, you bet on a virtual one. There are many benefits, such as the ability to quickly place bets and to find out immediately if you have won. An average football game lasts 5 minutes. This category includes horse racing, dog racing, basketball, football and tennis. You can register on Betworld in just a few minutes. To activate your gaming account, you must confirm your identity and make an initial payment. There are several methods to choose from. You can use Mastercard, Visa, Ochopay, Bank Transfer, Skrill, 1-Tap Skrill, Neteller, Ecopayz, Paysafecard and Betting Vouchers. Finally, Betworld is also available on mobile devices, both on Android, iOS and Windows Phone operating systems. You can access the casino or the betting section through the official app on either your smartphone or tablet. Just log in using the registration credentials. This website is purely for informative and entertainment purposes only. We do not accept any form of gambling, betting or wagering. We do not encourage and neither do we promote any form of illegal / prohibited gambling.